Visit this exhibit, on display April 4 to May 13, in-person in the First Tier Lobby of Davies Symphony Hall to see additional photographs, artifacts from the SF Symphony Archives, and a video featuring conductor Yan Pascal Tortelier. Known for craftsmanship, wit, and ingenuity, composer Maurice Ravel remains among France’s most popular composers. His music was rooted in his classical forefathers and inspired by explorations of his modern world. Contemporaries found his integrity admirable, his humor engaging, and his character genuine. His success brought him to North America in 1928 for a four-month tour where he performed to sold-out crowds delighted by his unique and exquisitely detailed music. One stop of twenty-five was San Francisco, where he conducted the San Francisco Symphony. This year we celebrate the 90th anniversary of this tour, and honor the life and legacy of this distinct and versatile composer. Join the celebration! Buy tickets to French Greats: Debussy and Ravel April 19 to 21, featuring much of the same repertoire Ravel performed with the orchestra in 1928. Born in 1875 in Ciboure, France, Maurice Ravel’s parents encouraged him to pursue his musical inclinations from a young age. At 14 he entered the Paris Conservatory, where he studied piano and composition on and off for nearly a decade. By the early 1900s Ravel had achieved international success, with his work performed regularly in Europe and North America. His compositions mixed modern influences with neoclassical foundations, finding inspiration in everything from the Javanese gamelan to factories. Famously called “the most perfect of Swiss Clockmakers” by Stravinsky, he was a dedicated craftsman, often spending years completing a piece and leaving many unfinished at his death. His relatively small but excellent oeuvre includes ballets, piano works, chamber music, and a series of wonderful orchestrations of works by other composers. During this time in Paris, Ravel was a member of Les Apaches, a lively group of impassioned young artists and intellectuals that developed his appreciation for contemporary music and poetry. Through this group, he fostered some of his longest-enduring personal and artistic relationships. 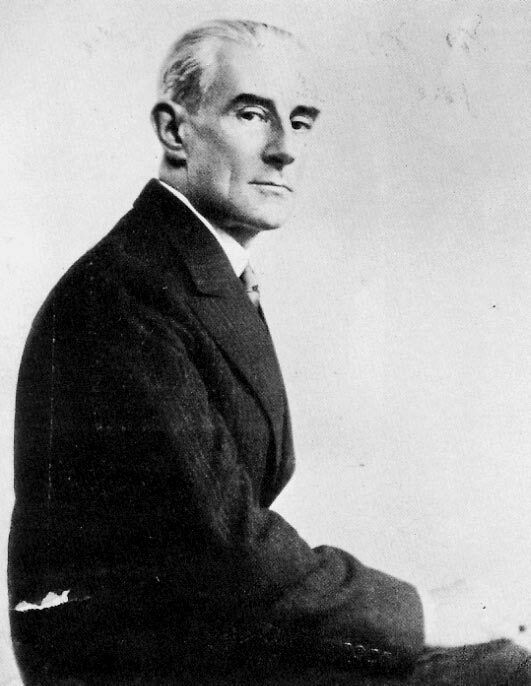 In a testament to his integrity, Ravel was adamant about contributing to the war effort after Germany invaded France in 1914. Rejected by the military more than once because of his health and stature (he weighed just over 100 lbs), he was eventually accepted as a driver of supply trucks and ambulances. He served in this role for two years. LEARN MORE: Did WWI Change French Composer Maurice Ravel and his Music? Ravel was a lifelong bachelor who once proclaimed, “The only love affair I ever had was with music.” His closest personal relationship in life was with his mother, with whom he lived until her death when he was 45. He lived the remainder of this life in the Paris suburb of Montfort-l’Amaury, with the companionship of six Siamese cats, surrounded by an eclectic collection of toys, book, and records. At age 57, Ravel developed deteriorating aphasia after suffering a head injury. Unable to compose or eventually speak, he died after an unsuccessful brain surgery in Paris in 1937. Recent studies of Ravel’s condition have suggested his mysterious dementia began as early as 1927. Some argue this illness influenced his later works, including Boléro and the Piano Concerto for the Left Hand. 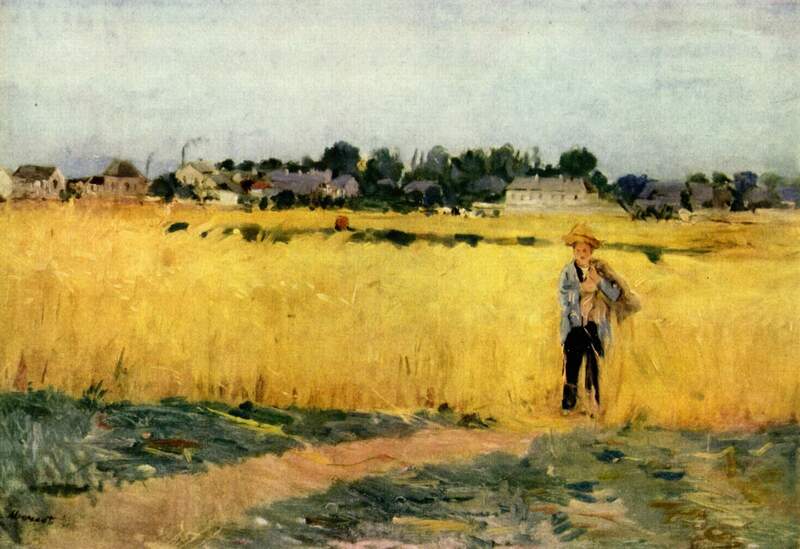 In the Wheat Field at Gennevilliers by Berthe Morisot, 1875. Click to view large. The term “Impressionism” was coined by a Parisian art critic in 1874 to describe the collective aesthetic in an exhibition that included works by Monet, Morisot, and Cézanne. These artists revolutionized the use of freer brush strokes and color in their desire to capture reality as perceived in the moment. Debussy and Ravel have been labeled Impressionist composers, a term analogous but not directly connected to the movement in art. Their music took liberties with form and tonality, and experimented with harmony to create figurative “impressions” of their subject matter. Impression, Sunrise by Claude Monet, 1874. Click to view large. 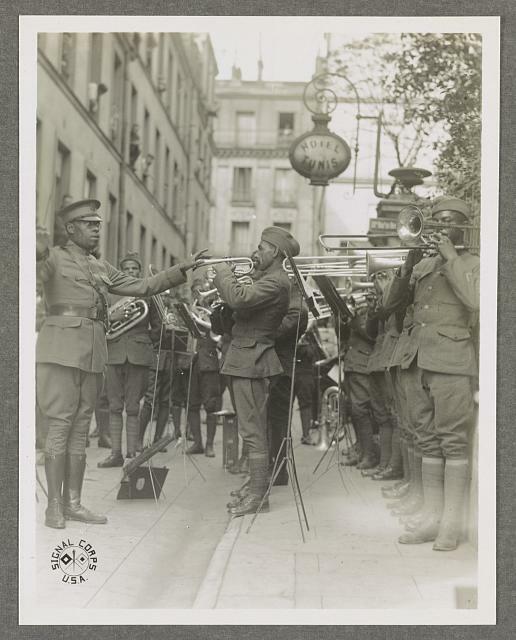 Paris was introduced to jazz by African-American troops and their bands during World War I, and it immediately caught the ear of composers of the day. “I frankly admit I am an admirer of jazz, and I think it is bound to influence modern music,” said Ravel, “It is not just a passing phase, but has come to stay.” The influence of jazz tonalities and rhythms can be heard in many of Ravel’s works, including Violin Sonata No. 2 and Piano Concerto for the Left Hand. A vocal proponent of jazz, Ravel sought out performances both in Paris and, during his 1928 tour, across America. 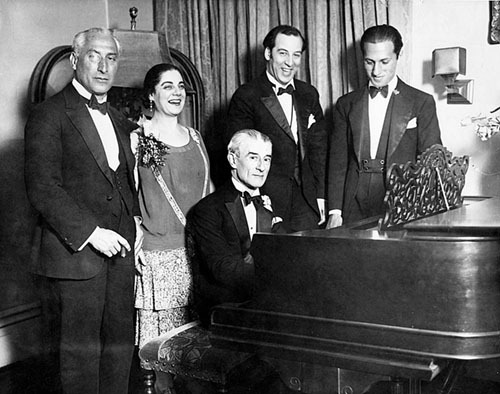 When asked what information should be given to the Americans before the tour, Ravel wrote, “You can add, if it might please them, that I like jazz, far more than grand opera.” During his time in New York he met George Gershwin, and accompanied him to several famous jazz venues in Harlem, including the Cotton Club and Savoy Ballroom. 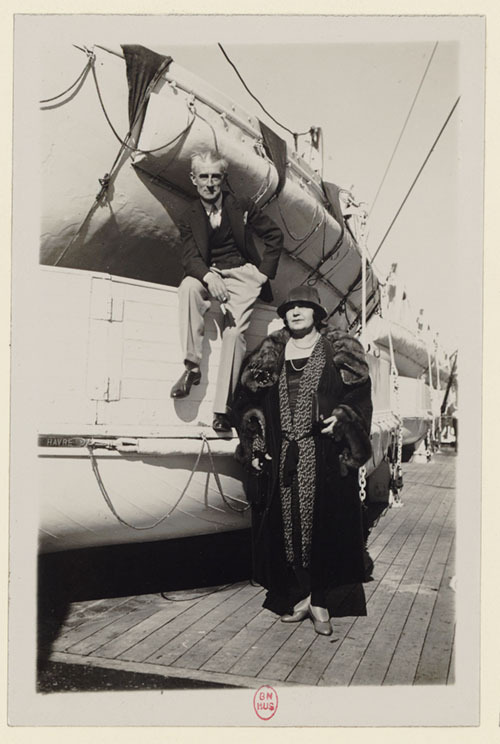 On December 28, 1927, Maurice Ravel set sail from France bound for New York to begin a four-month tour of North America, where he was to conduct concerts of his own compositions and orchestrations and give recitals of his piano music. His reputation preceded him. “As soon as we arrived in the harbor,” he wrote to his brother, “a swarm of journalists invaded the boat, with cameras, movie cameras, and cartoonists. . . [at the hotel] every minute they would bring me baskets of flowers, and of the most delicious fruits in the world.” The composer enjoyed enthusiastic receptions at each of his 25 stops. When resounding applause erupted from a packed audience at a concert of all-Ravel music in New York, he emotionally told his friend “This would never happen to me in Europe.” When he was not performing, he was at receptions held in his honor, seeking out jazz halls, or exploring the landmarks of America. 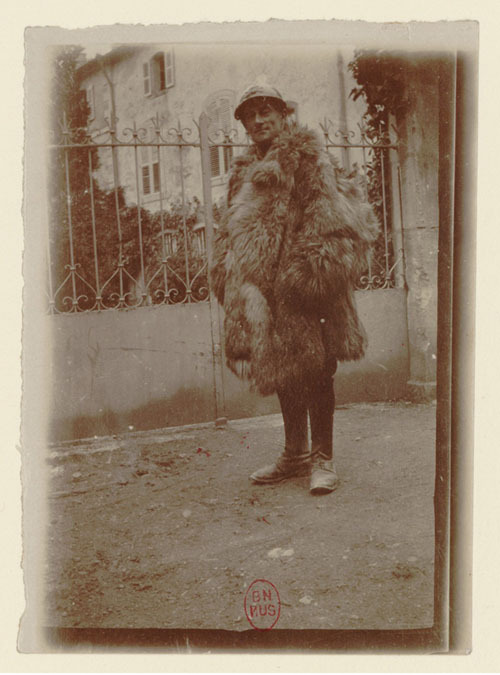 After the success of the tour Ravel returned to France on April 21, 1928. My dear little Édouard . . . The concert in New York went well. Flattering reviews, at times an entire page. Only the French newspaper in New York didn’t write about me. Maurice Ravel enjoyed a close relationship with his brother, Édouard Ravel. Since arriving in the United State, this is the first opportunity I have had to write. 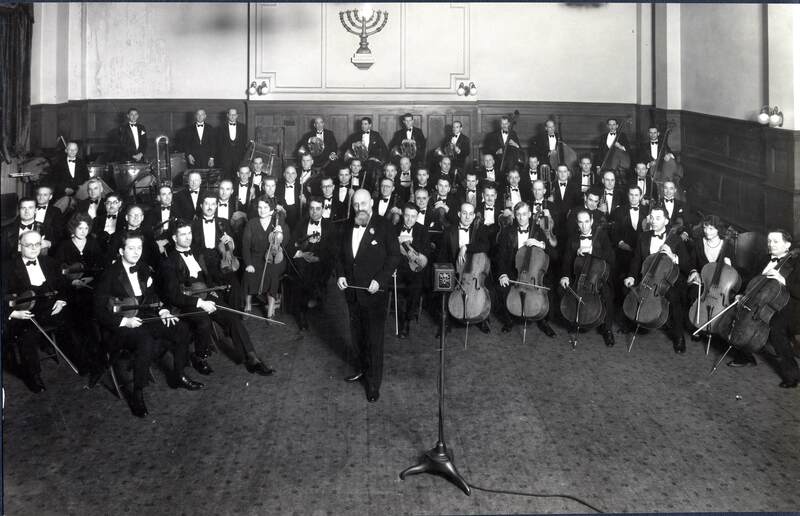 I hasten to take advantage of it in order to ask you to be my spokesman to your colleagues, to tell them of my joy in hearing my works performed with such perfection by an orchestra which is rightly considered to be the world’s finest, and whose conscientiousness in capturing the spirit of my music touched my profoundly. Rene Polain, first violinist with the Boston Symphony, acted as an interpreter for Ravel during his time in Boston and New York. The Boston Symphony, under Serge Koussevitzky, played an all-Ravel concert to a sold-out audience, including the very touched composer. *I was supposed to have lunch with Charlie Chaplin, but I didn’t think it would be any more amusing for him than for me: he doesn’t know a word of French. Left Denver last evening . . . Will leave [Omaha] tonight about ten o’clock after having heard Omaha’s jazz, which is famous. I spent 3 days in Denver, a city situated at an altitude ot 1600 meters (gold and silver mines). The air is very pure. Always bright sunshine. . .
Maurice Ravel arrived in Oakland via the Overland Limited on January 31, 1928. 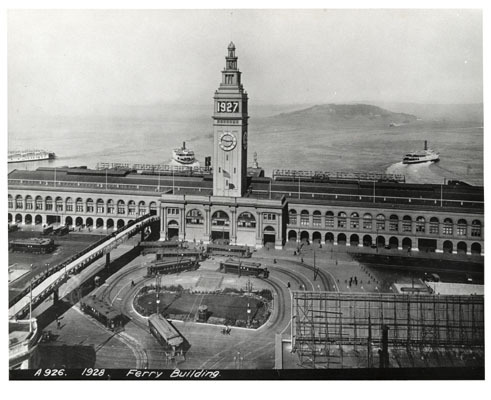 Rushed by a porter from depot to pier, he crossed San Francisco Bay and docked at the Ferry Building. Waiting to greet him was the bushy-bearded Alfred Hertz, only the second music director the San Francisco Symphony had employed, but who in the past thirteen years had put the Orchestra on America’s musical map. Now he shepherded the composer to a waiting car, which sped to the Curran Theater. On stage the orchestra waited for Ravel to start the rehearsal. San Francisco was only the middle stop on the composer’s long cross-country journey. On this Tuesday afternoon, Ravel and the musicians worked together, preparing their weekend concerts. The program: all-Ravel, plus two short Debussy pieces he’d orchestrated. 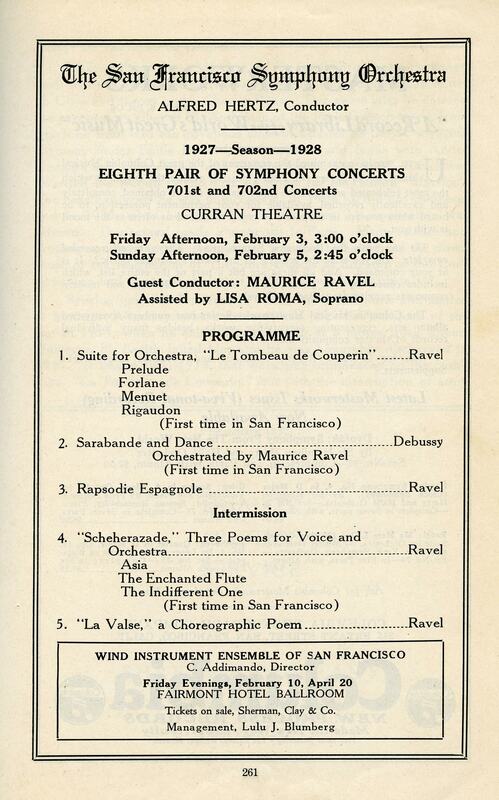 Program from Eighth Pair of Symphony Concerts noting the appearance of guest conductor Maurice Ravel, 1928. Click to view large. 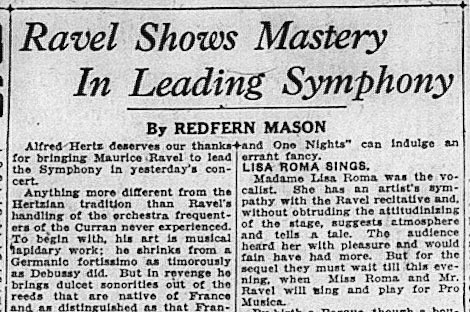 Music critic Redfern Mason's review of the San Francisco Symphony Orchestra performance with Ravel on February 3, 1928, San Francisco Examiner, February 4, 1928. Click to view the whole review/read a transcript. Ravel would have enjoyed the applause from that discriminating audience. Surely he knew the reputation the San Francisco Symphony had built since its inaugural season, in 1911. Perhaps he had heard Hertz and the Orchestra on their recordings, the Orchestra’s first, made in 1925. Perhaps he had seen Hertz on the cover of Time magazine in the fall of 1927, his image there heralding the Symphony’s arrival on the scene—in an era when the West Coast was still considered an outpost. 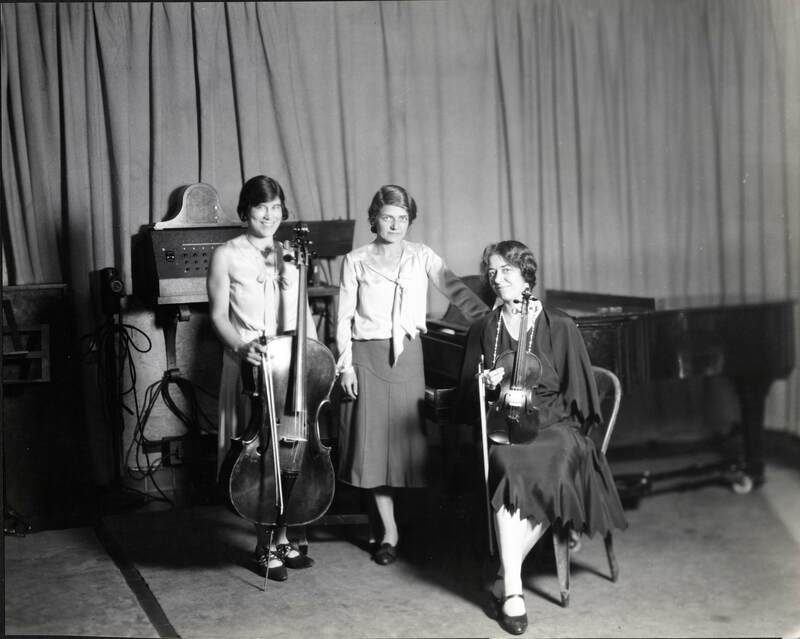 As Ravel conducted, he would have noticed more women players than he’d encountered on his other stops, for in 1925 the Symphony became the first US orchestra to employ women other than harpists. In fact, much of what we take for granted about San Francisco concert life was introduced by Alfred Hertz in the 1920s: regular performances for children, a summer series, radio broadcasts, even touring. By 1928, the San Francisco Symphony had embarked on all these. It had moved into modern times. Ravel, by Roger Nichols. Yale University Press, 2011. A Ravel Reader: Correspondence, Articles, Interviews, edited by Arbie Orenstein. Columbia University Press, 1990. Ravel, by Jean Echenoz. The New Press, 2005.